Dr. London has been practicing internal medicine in the Boston area and caring for people and their diverse health care needs for over 20 years. Dr. London is a graduate of Tufts University and received her M.D. degree from Tufts University School of Medicine in 1991. She teaches with the Harvard Medical School and Tufts University School of Medicine and is a staff physician at Brigham and Women’s Hospital, Beth Israel Deaconess Medical Center and Beth Israel Deaconess Hospital-Needham. Dr. London treats every patient relationship as a unique partnership. Each patient is deserving of her empathy and advocacy. From the start of her medical career, 20 years ago, attentive individualized care has always been her approach. With a small medical practice, she can devote more time and attention to each and every person. Dr. London is on the staff of Beth Israel Deaconess Medical Center in Boston, Beth Israel Deaconess Hospital-Needham, and Brigham and Women’s Hospital. Dr. London is a Clinical Instructor in Medicine for Harvard Medical School and a Lecturer for Tufts University School of Medicine. In addition, she has been a member of various committees at both Beth Israel Deaconess Boston and Needham. After growing up in the Boston suburbs and attending Tufts University as an undergraduate, she earned her medical degree (M.D.) at Tufts University School of Medicine. Dr. London completed her residency in internal medicine at Beth Israel Hospital in Boston (Now, Beth Israel Deaconess Medical Center “BIDMC”) with a focus on primary care internal medicine for which the BIDMC Primary Care Program is renowned. As a practicing internist in the Boston Area for over two decades, she has had the privilege of working closely with many of Massachusetts’s fine medical institutions and physicians to deliver care to many thousands of patients. As a result, she has a vast network of resources that can further complement her superb training. Dr. London honed her skills for caring for medically and socially complex individuals while working for a nonprofit organization, The Urban Medical Group, Inc., in Jamaica Plain, from 1994-1998. The medical, economic, ethnic and social diversity of the population that she served, combined with the diverse settings in which she practiced (office, hospital, home residence, nursing home and rehabilitation facility), further strengthened her foundation as a practioner of coordinated, complex and effective primary care medicine while also attending to more common needs of otherwise healthy individuals. She was constantly involved with the hands on clinical teaching of medical students, residents and nurse practioners. Dr. London also served as Medical Director for several medical facilities. From 1998-2005, Dr. London built a large and busy practice at Charles River Medical Associates in Natick where she also served on the Board of Directors. Once again, she cared for medically diverse individuals in all settings (office, hospital, nursing home, rehabilitation unit and home residence). Dr. London’s move back to Beth Israel Deaconess with a hospital affiliated group office in Needham in 2005 allowed her to concentrate on outpatient medical care and clinical teaching. She served on hospital committees, supervised medical interns and residents from Harvard Medical School and was a site coordinator for Tufts Medical students during their physical diagnosis course. Dr. London continues to participate in most of these same administrative and teaching activities since founding Comprehensive HealthCare. While dedicating herself to outpatient care, Dr. London took pride in giving the best care possible to her patients while meeting all of the ever burgeoning insurance obstacles placed in her path. Dr. London’s practice grew larger than ever as the resources she needed to care for nearly 2000 patients kept shrinking. Having the time to listen and care at every visit was threatened. She chose to continue her focus on quality care, rather than productivity, when she made her move toward starting a membership practice. Dr. London started London Medical Group, LLC and Comprehensive HealthCare, LLC on January 1, 2009. Now, Dr. London has more staff assistance and more time to attend to the medical and emotional needs of her patients in a timely and unhurried manner. She can offer legitimacy and support to people in need of acute, chronic, and preventative care. Her office has a secure electronic medical records system and is a pioneering practice site for the Massachusetts E-Health Collaborative, a state sponsored organization that seeks to integrate care between small office providers and institutions through use of electronic medical records. Dr. London chairs the Medical Education and Library Committee for Beth Israel Deaconess Hospital- Needham and runs the Grand Rounds weekly lecture series for the hospital. She remains an active teacher for both Harvard Medical School and Tufts University School of Medicine. Education, training and innovation have played an integral part of Dr. London’s medical career. She cares for patients from age 16 and up. She has particular interests in preventative care, women’s health, men’s health, nutritional counseling, geriatric care, management of chronic conditions and complex medical care. Dr. London is certified by the American Board of Internal Medicine and is licensed to practice medicine by the Commonwealth of Massachusetts Board of Registration in Medicine. 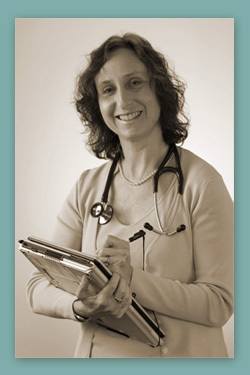 Dr. London is married, has 2 children and 2 dogs and lives in Dover, MA.